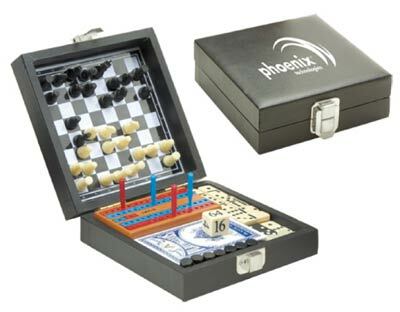 Promotional Games Sets in Bulk: chess, backgammon, checkers, cribbage, dominoes & playing cards, custom printed. Budget Prices in USA and CAnada. High quality, yet inexpensive 6-in-1 Game Sets in bulk, customized with you logo. We also supply blank (not personalized) 6-in-1 Game Sets for $5.95 each. Free artwork design and Free proofs! American clients pay no taxes. The unit prices below include your 1-color custom imprint on one side. Add $0.50 per game set for each additional imprint color. We also supply blank (not personalized) 6-in-1 Game Sets for $5.95 each. PRODUCTION TIME: 7-10 days after art approval; Rush 3 day production is available: contact us. Blank items ship next day. It contains Backgammon, Chess, Checkers, Cribbage, Dominoes & Playing Cards. Approx. Size: 5" x 5" x 1 1/2"
Shipping info: Case Dimensions 18" X 13" X 12"